Former interns for the CAS Dean's Office. TAMPA, Fla. -- If you got skills, we got snacks! The College of Arts and Sciences Dean's Office is looking for interns who are hungry for experience. Interns will work during the spring semester to assist with marketing and events. Applications are due Friday, Dec. 4, 2015, at 4:30 p.m. in Cooper Hall (CPR) 107. The intern positions available include: reporter, photographer, public relations/marketing/advertising, events planner, social media, graphic designer, website design/management and broadcast/video production. Interns can receive college credit for the internship, pending department approval. "This is an excellent opportunity for motivated students to gain more experience and build their portfolios," said Michele Dye, communications and marketing director for the College of Arts and Sciences. "Several of our former interns have gone onto successful careers and used this internship experience as a springboard to reach their goals." 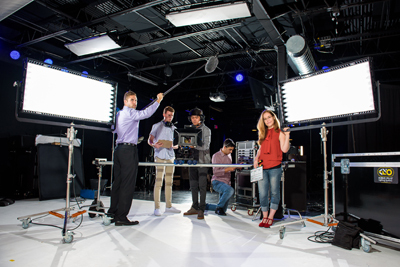 Dom Benjamin (BAMC 2014) spent almost two years interning for the CAS Dean's Office, where he honed his video production abilities. Benjamin said he appreciated the variety of projects and the opportunity to learn new skills. "I discovered there were so many more skills I wanted to develop," said Benjamin, who now works at Duke University as its social media manager. "Michele gave us free reign to work on projects from conception to completion, which I can say from personal experience is very rare to have in any internship. I did my best to take advantage of that freedom and the result was that I got to add a lot of cool stuff to my portfolio." In addition to building their portfolio, interns never go hungry thanks to a wide assortment of snacks provided by the director. The creative office environment allows for interns to collaborate and learn from each other while working closely with full-time marketing and events professionals.